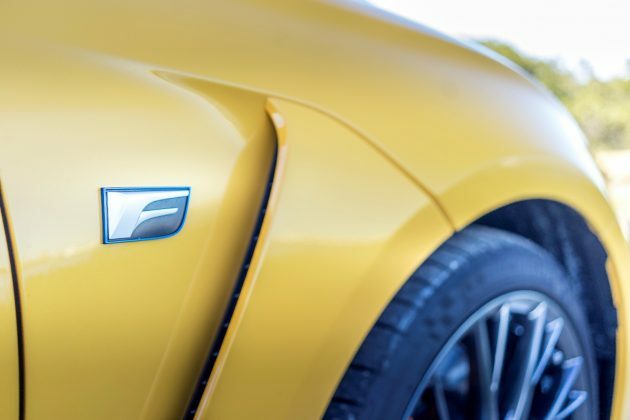 IT looks wicked, especially in its newest colour – Zinnia Yellow. It sounds awesome at full noise. And above all else it oozes style. 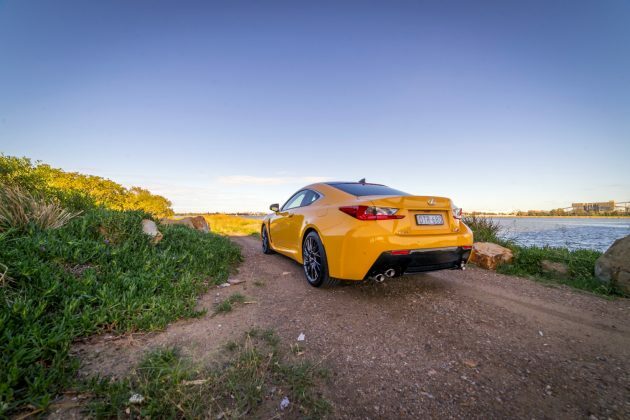 The 2018 Lexus RC F Carbon is a genuine head turner, and Lexus has bought a bunch of upgrades along for the ride. Underneath the hood of the RC F is a grunting 5.0-litre V8 engine, producing 351kW of power and 530Nm of torque. That power plant has direct injection and dual VVT-i by the way, and is coupled with an 8-speed SPDS automatic transmission. 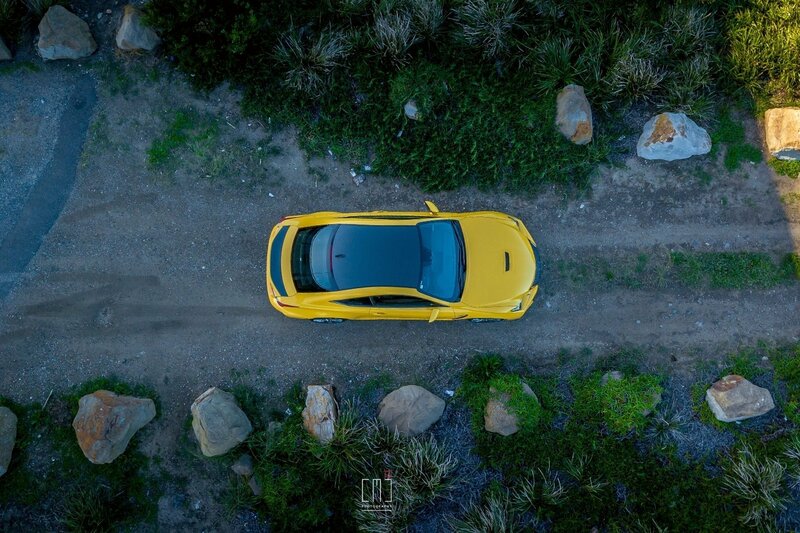 It’s wicked fun to drive hard, thanks to its sequential and paddle shift options, and has some five drive modes available; Eco, Normal, Sport S, Sport S+ and custom. Sport S+ was our favourite, for obvious reasons. Fuel economy is surprisingly good at 10.9-litres/100km and we managed to achieve that number on a few of occasions. Drive it hard though, and you can very quickly kiss those figures goodbye, as one would expect. It has a torque-vectoring diff, which delivers multiple modes including Standard, Track and Slalom. There’s also performance monotube shock absorbers, VDIM with sport and expert modes, and the ultra cool adaptive variable suspension. If that wasn’t enough for you, add in switchable engine cycles, electric power-assisted steering, double wishbone front suspension and multi-link rear suspension. To make sure you stay on the road, there’s also stability and traction control. The downside to all this control over the engine and vehicle operation is that it feels lazy and almost loafer-ish, if that’s a word, and to make it do its performance car thing, it needs a kick in the guts. That means driving it hard to make it roar like an actual V8, and not float on the wind like it does in Eco mode. On top of that, because it only has a 66-litre tank, you find yourself going through fuel like it’s tap water if you’re out having fun. Watching the retractable rear wing pop up and down at will when doing that is pretty cool too, and reminded us of the safety features of the car, and it’s ability to think on its feet, or wheels, as it were. Actually this is the safest RC F ever built, and it includes a bunch of new tech things to make your drive in this performance car better than it’s ever been. Among them, the usual suspects, like eight SRS airbags. There’s also a reversing camera with rear guide assist, blind spot monitor, rear cross traffic alert, pre-collision (including pedestrians) safety warnings and braking, and the new lane departure warning with steering assist. We’re not done yet either, as there’s also radar active cruise control, auto high beam, an actual car alarm (old school we know), ABS with vertical G sensor, EBD and brake assist, and finally, hill start assist. 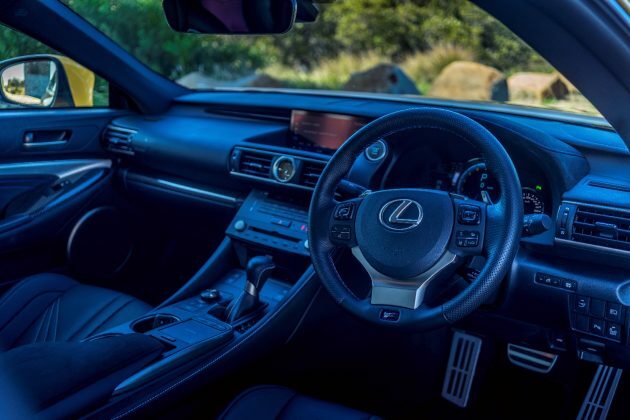 It does still have the less than ordinary foot pedal hand brake, which Lexus really needs to ditch, and we don’t particularly love the touch pad infotainment system controls either, but they are improved over what came before. While we’re talking infotainment though, there’s now a much improved 10.3-inch screen, with a great SatNav and SUNA live traffic alerts, to go with the astounding 17-speaker 835w Mark Levinson DVD audio sound system. The RC F Carbon also gets an exclusive LFA-style digital instrumentation panel and an easy to read HUD, as well as dual zone climate control air conditioning, a leather accented interior in four colour choices, and carbon fibre bits everywhere. The power operated, heated and ventilated sports front seats are really comfortable, and include F embossed headrests. It’s a 4-seater though; there’s a centre arm rest in the back, but there is a little leg room in the rear and it feels wider than it should. That feeling of extra width likely that comes from the missing centre seat. Head room is an issue though, unless you’re a 6-year-old in a booster seat. She loved sitting in the back, but getting her seat in and out was astoundingly difficult. It comes with Bluetooth connectivity (you’ll notice we haven’t mentioned those play/auto functions you might associate with a smart phone), voice control, and all kinds of touch sensitive things. A fair chunk of the technology inside feels a little dated in an odd way though, and getting anywhere in the infotainment system is painful, and definitely distracting if you need to do it while your driving. There’s 362-litres of storage in the boot and a retractable steering wheel (which is also electrically adjustable) and seat slide to help you get in and out. There’s also smart and push button start on board to make it easier to get going. Oh, it has Lexus Enform local information suite built into the infotainment system too. The car also comes with acceleration sound control (just to make sure your V8 sounds like, well a V8 should). We don’t like it. 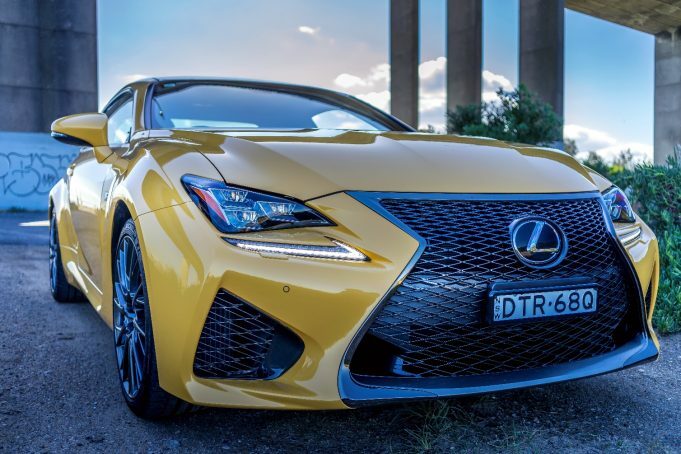 Externally, as we said already, the 2018 Lexus RC F Carbon looks amazing, and it’s on the outside where it shows the most, with a carbon fibre retractable rear wing and roof. It loses the sun roof as well, shedding some weight along the way too. 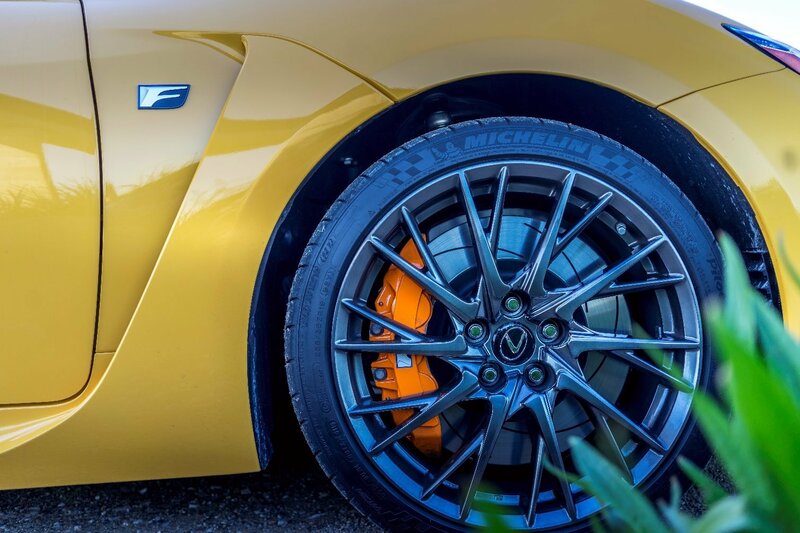 It gains High+ 19-inch forged matte finish alloy wheels, instead of the standard RC F wheels, and keeps RC F features like the quad exhaust system, mesh grille, triple-stack LED headlights and rain sensing wipers. It hits the road at around $163,000 in a bunch of fashion colours, including new hero colour Zinnia Yellow, borrowed from the LC 500, Infrared, White Nova, Cobalt Mica, Lava Mica, Titanium, Graphite Black and Mercury Grey. Our test vehicle was provided by Lexus Australia. 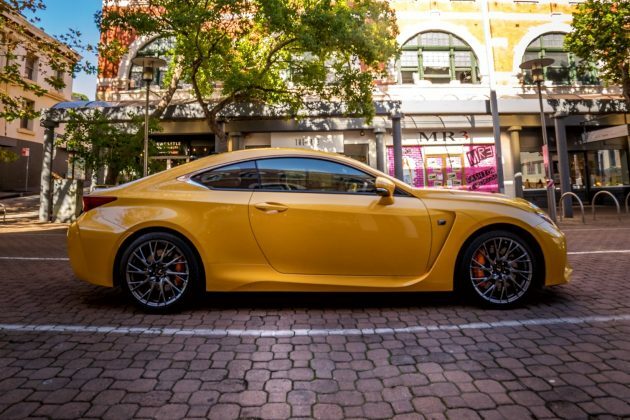 To find out more about the 2018 Lexus RC F range, including the Carbon, contact your local Lexus dealer. Lexus RC F Carbon pictures courtesy of CMC Photography. Pros - safety improvements; beastly look and feel; oozes style; sounds magic at full noise. Cons - feels lazy and loafy; foot pedal hand brake; touch pad is distracting to use while driving.